A worker from the Cobra Energy Company, contracted by the Army Corps of Engineers, installs power lines in the Barrio Martorel area of Yabucoa, a town where many residents continue without power in Puerto Rico, on May 16. For more than a week, Puerto Rico's representative in Congress has been urging the Federal Emergency Management Agency to extend the contract under which mainland power crews have been helping repair the island's power grid. On Thursday, FEMA denied that request, while approving a separate one by Puerto Rico's governor to maintain hundreds of emergency generators on the island. The decision means that Friday is the last day that line restoration crews hired by the U.S. Army Corps of Engineers will work to restore power in Puerto Rico, leaving the rest of the job to crews working for PREPA, the island's power utility. The decision comes as about 16,000 homes on the island remain without power eight months after Hurricane Maria, according to power officials. That represents a little more than one percent of PREPA's 1.47 million customers. Officials for PREPA and the Army Corps, the agency that hired the mainland contractors at FEMA's request, have said they expect everyone on the island to have power restored by May 31, a day before the official start of the Atlantic hurricane season. But in her urgent request that FEMA extend the Army Corps mission, Rep. Jenniffer Gonzalez expressed doubts that PREPA had the resources to complete the job quickly. "I must urge that there be an extension of the mission that allows agency and contract crews to remain in place to see that the system is 100 percent restored," Gonzalez wrote. It appeared, however, that her request may not have been coordinated with PREPA itself. In a letter, Mike Byrne, who is leading FEMA's response in Puerto Rico, said his decision not to extend the line restoration contract came "per the direction provided by the Energy Unified Command Group and confirmed by the PREPA Chief Executive Officer," Walter Higgins. The Energy Unified Command Group is the multi-agency group coordinating the power restoration effort, comprising FEMA itself, the Army Corps, which reports to FEMA, and PREPA. NPR requested a copy of the communications by which the Energy Unified Command Group directed FEMA not to extend the line restoration contract, but FEMA did not immediately provide them. A spokeswoman for Rep. Gonzalez did not immediately respond to a request for comment, nor did a spokesman for PREPA. The Army Corps currently has about 700 line workers on the island whose work ends Friday. In an earlier statement, PREPA said its own crews were prepared to take over where the departing crews leave off. 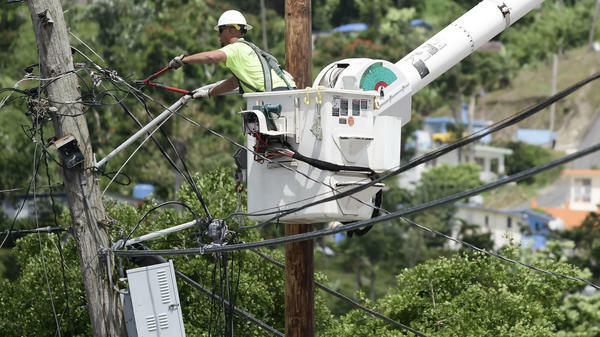 In addition to its own line workers, PREPA has hired contracted crews through a nearly $1 billion agreement with Cobra, a private mainland company. Places still waiting for power are among the most difficult to reach because of mountainous and forested terrain. They include areas in the municipalities of Arecibo, Caguas, Humacao, and in Yabucoa, the city where Hurricane Maria made landfall.